Yi Shin (Nora) Chiang, born in Taiwan in 1987, is a Fine Art artist now based in San Francisco. Her love in painting started at the age of 16. In 2005, the winning of 2nd place of Canada B.C. Annual Memorial Contest was a milestone for Yi Shin and this encouraged her to receive her B.F.A. in Illustration from Academy of Art University. After graduation, her passion in art led her to pursue her MFA in Fine Art in Academy of Art University. In 2013, she got the opportunity to go to Italy for a summer-term program at Santa Reparata International School of Art. She currently emphasizes on oil medium and is knowledgeable in watercolor, gouache, acrylic, etc. 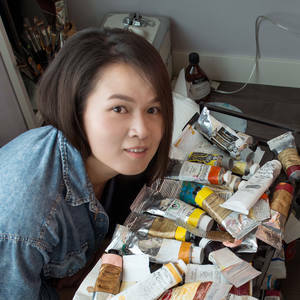 Majority of her works focus on poortraiture, figurative, landscape, and cityscape.In addition, she is currently doing a portrait series, "Half Empty, Half Full" that examines the critical moment when two opposing emotions coexist in competition, the depiction of an unresolved dilemma as revealed in the facial expression of someone paused at a turning point. “This ambiguous moment is both optimistic and pessimistic at the same time,” explains Chiang. “There must be times in life when you hit a crossroads. Any kind of decision you make can change your life completely, but there would be no turning back once the choice has been made.” Chiang works exclusively with close friends and family, taking countless photos in preparation before executing a life-size study, then the final portrait. The figurative paintings represent earlier explorations of a similar theme in which ambiguity is expressed through the suggestion of motion, yet encompasses emotional ambivalence as well. Comparison of the two series provides insight into the maturing of the underlying concept.